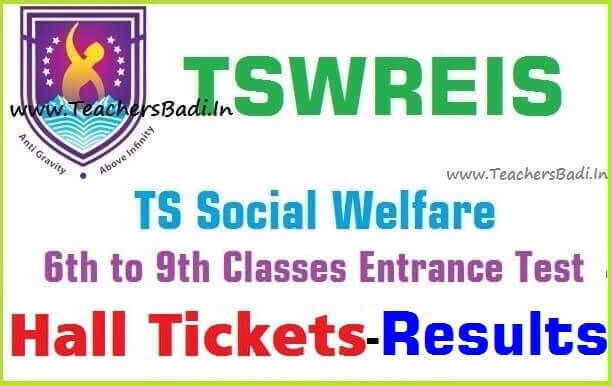 TS Social Welfare 6th,7th,8th,9th classes Entrance Test #results 2019/Telangana SC Gurukulams Entrance Test hall tickets,results /#TSWREIS 6th to 9th Classes admission test hall tickets results 2019, New TSWR Schools entrance hall tickets results 2019, TS Social Welfare Residential Schools Common Entrance Test 2019 hall tickets. Govt of Telangana State, Social Welfare Department has given the 6th to 9th classes admission test notification for admission into Classes VI to IX in TSWEIR Schools for the Academic Year 2019-2020. Telangana State Social Welfare Residential Educational Institutions Society (TSWREIS) invited the online applications from the eligible students for admission into 6th to 9th classes in Telangana SWR Schools 2019-2019. So, online applications were invited to fill up backlog vacancies in TSWR Schools and backlog vacancies in existing TSWR Institutions. So, this academic year the TSWREIS was invited the online applications through online link @ http://tswreis.in from the eligible candidates for admission into 6th to 9th classes in its TSW Residential Schools. The admission test/Entrance Test would be conducted on ..-06-2019 (Sunday) by 11.00 AM to 01.00 PM by TSWREIS. TSWR Schools: The Telangana State Social Welfare Residential Educational Institutions Society(TSWREIS) visualizes to provide quality modern education to the talented students belonging to marginalized section of Society predominantly from rural areas through the use of modern techniques, Pedagogy and various experiential learning activities in a stress-free environment to make learning a joyful experience. On submission of application form online the candidate shall be received reference ID number which should be kept carefully for any kind of future correspondence. Submission of application can be considered to have been completed only on receiving reference ID number. On completion of submission, the candidates shall take a printout of the application and store it for future use. Applied candidates shall download the hall tickets from website with use of online application reference id and hall tickets should be kept carefully, while you are going exam hall and upto announcement of results. 2. Check the Hall ticket carefully and bring discrepancies if any to the undersigned. 3. The Hall ticket should be preserved till the admission process is completed. 4. Answer the questions in OMR sheet only. 5. Candidates are advised to bubble the question paper series on OMR without fail. If it is not bubble the OMR cannot be valued. 6. Mobile Phones, Calculators and any other Electronics gadgets are not allowed to examination hall. 7. If the Photograph is not clear / Visible on the Hall ticket, the candidates should bring Photo Identify proof (Aadhar Card) and a Photo should also be pasted and got attested by Head Master concerned in the Certificate at the bottom of the Hall ticket. 8. No student will be allowed to the examination hall after 10 minutes from the commencement of examination. 9. Use blue (or) black ball point pen only to circle in the OMRs. 10. Usage of pencils is prohibited. 11. Out of the four given options only one should be bubbled. If more than one answer is bubbled it will not be valued. 12. Erasing, using markers, applying whitener is prohibited. 13. Do not make any stray marks on the OMR sheet. 14. OMR Sheet should not be mutilated (or) torned.